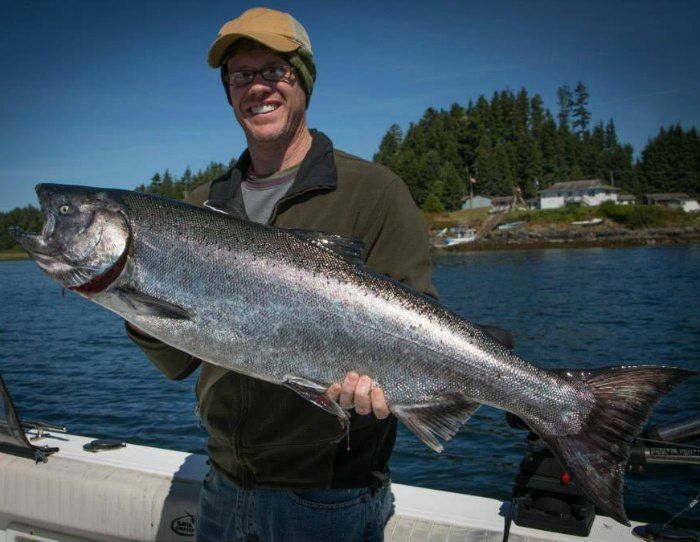 This past summer had people all excited with expectations of a record returns of Chinook headed through Ucluelet for the Columbia River. 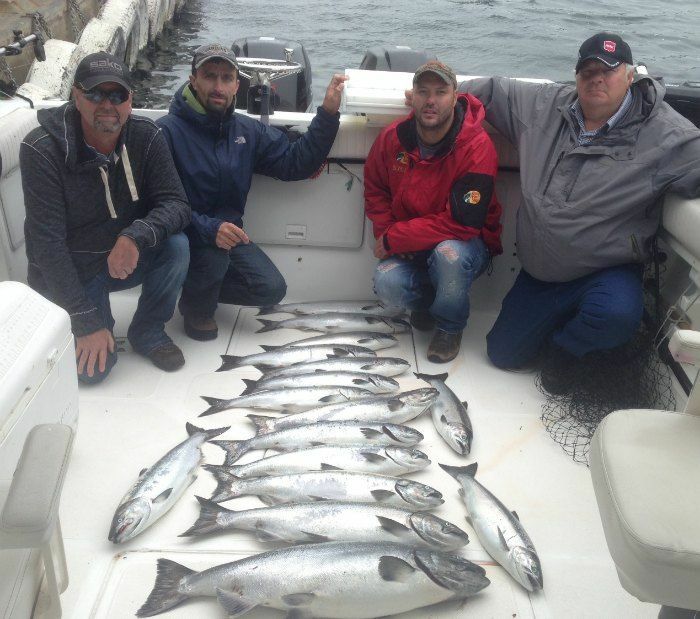 While the Columbia River did get a record return a little just over last years numbers, we didn’t see all these fish pass in front of us as expected. 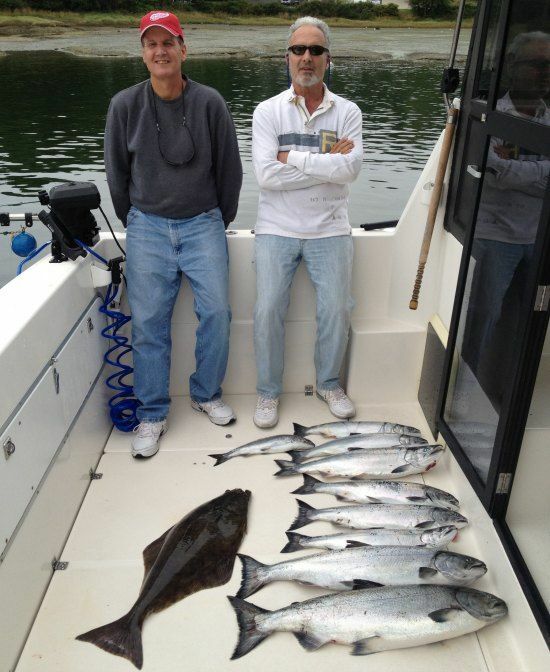 There was a big silver lining to the season however. 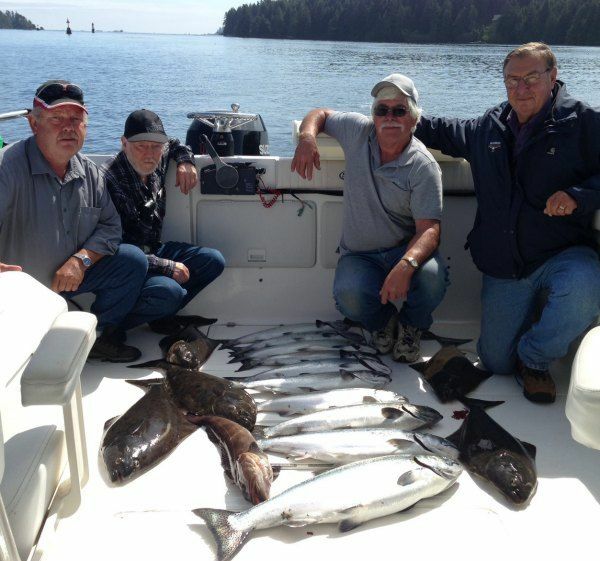 July was one of the most fun months I have had as a fishing guide with the whole month spent fishing within 15 minutes from the harbour in a semi protected/protected bay. 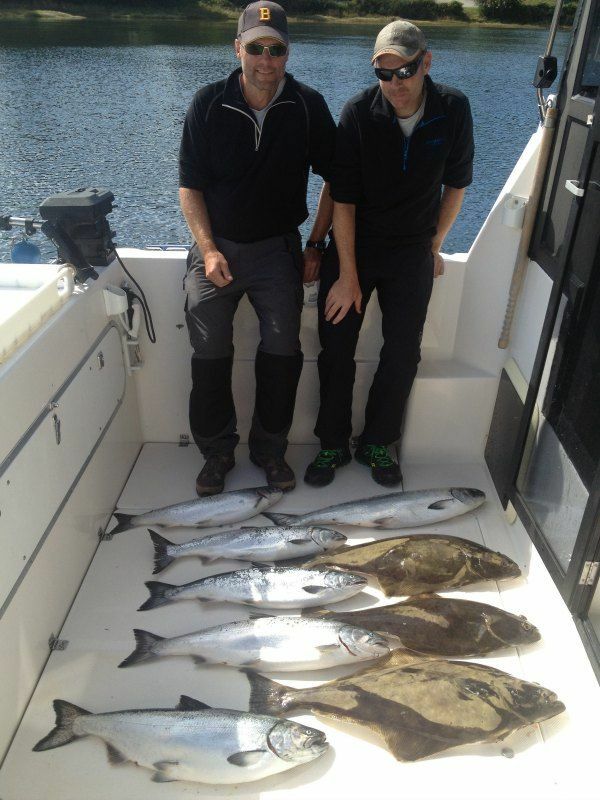 We started the month trolling as we normally do but ended up fishing live squid near the end. 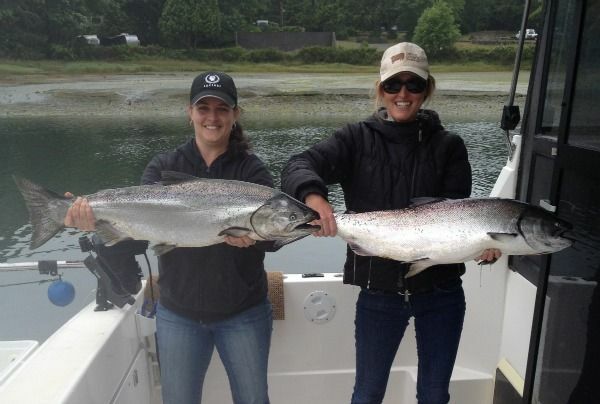 Not only did we get protection from the weather, but we got what I think is the most sporty way to catch a salmon. 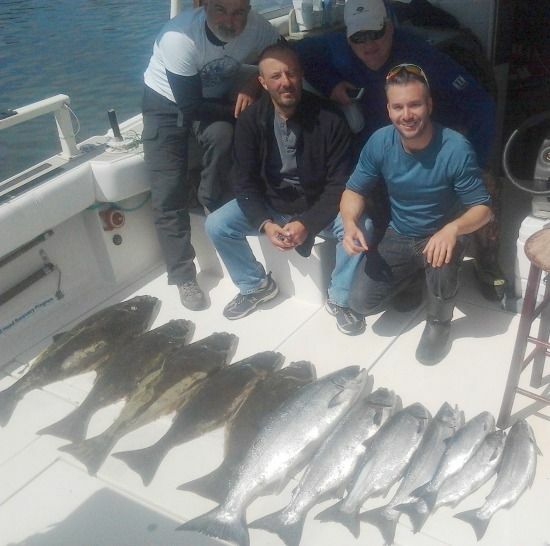 While downriggers are efficient ways to catch salmon, many people are would rather have a more hands-on way to start the battle of the scrappy Chinook. 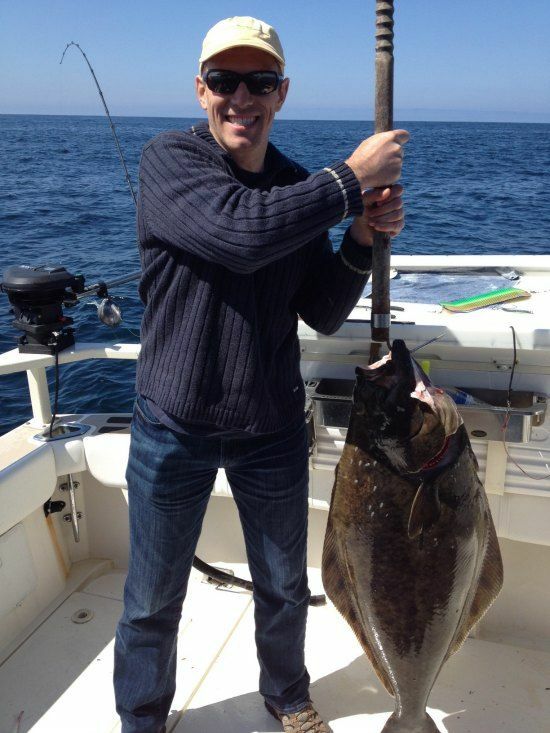 The Good news is that I think squid fishing is here to stay. 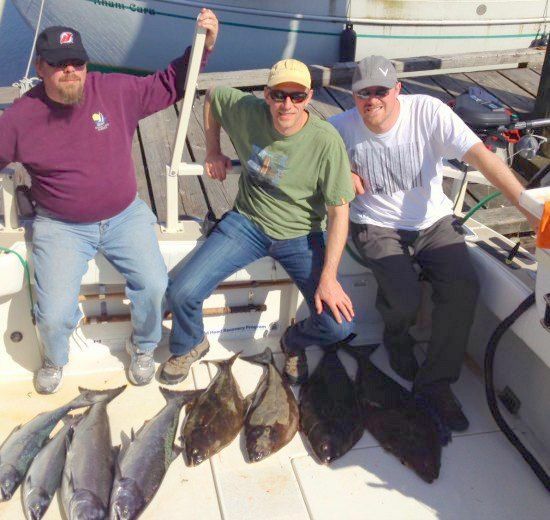 We hadn’t done it in years previous and learned a ton about it this past summer. 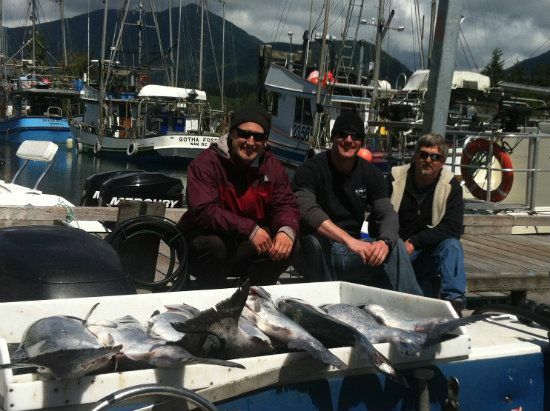 If squid numbers stay up as they are expected to, than we very well could have a repeat of last season. 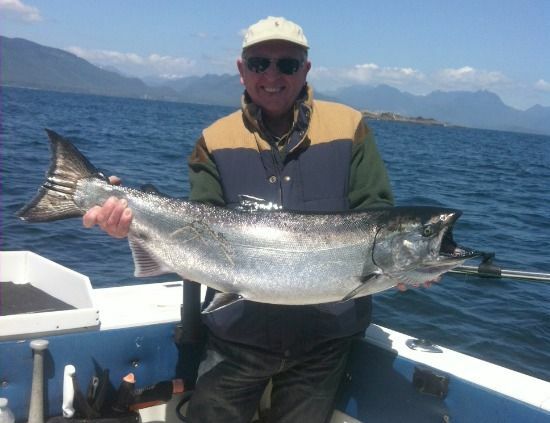 There is just one for thing to say about the fishery here during July: I must say our guides did an incredible job figuring out what the salmon were feeding on and our success during July was not what most guide here experienced. 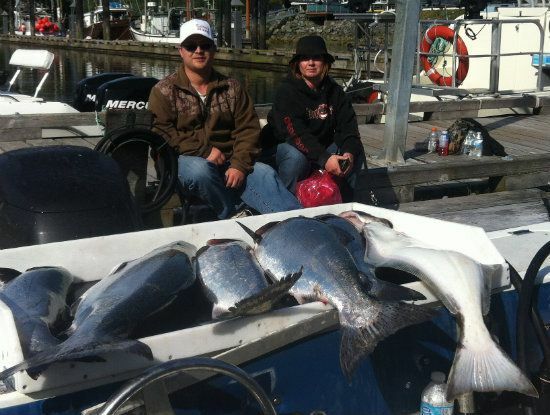 We ended up getting an average larger weight size per day than in 2012 and 13. 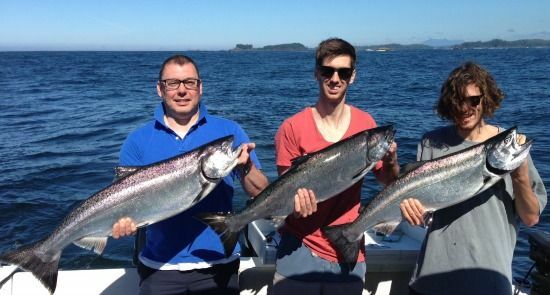 So what happened in May, June, August and September? 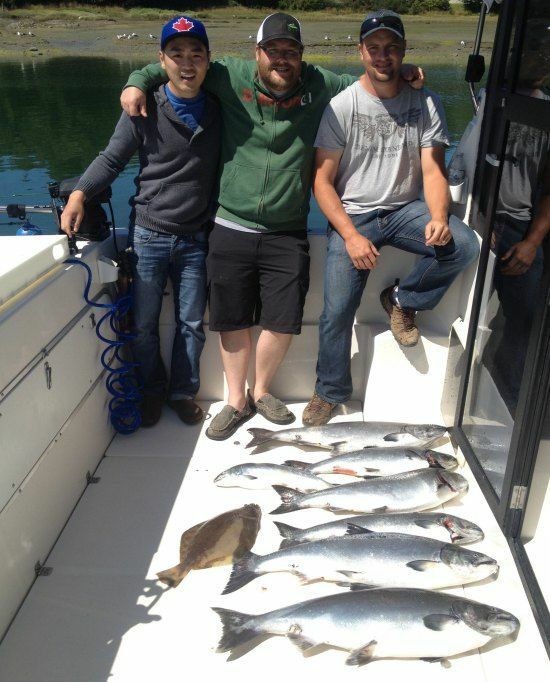 As not all of you came in July, we had some good fishing in all of these months. 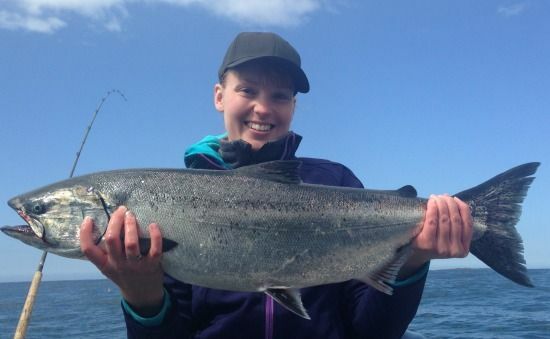 June was not quite as good as it was in 2013, but we still managed to get some good fish. 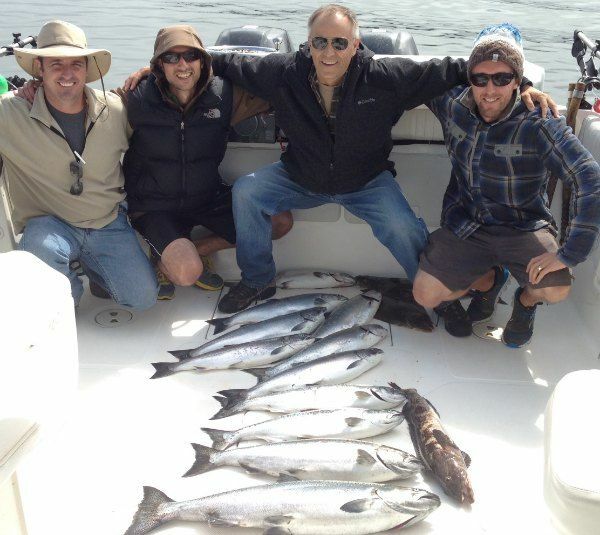 I would say the larger runs of Chinook were a little late coming through and it didn’t really pick up until the last few days of June. 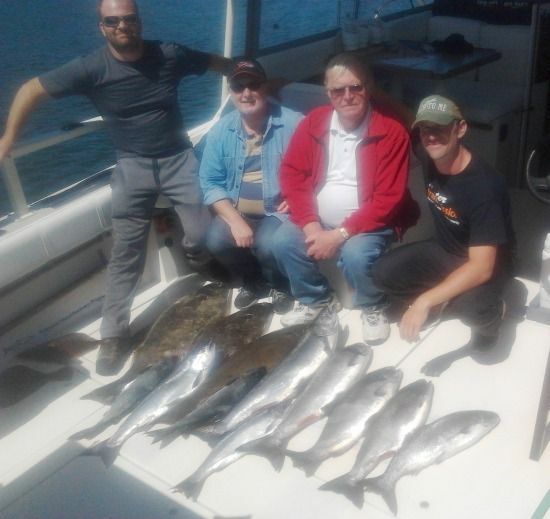 During August the hotspots changed almost daily and we had to be ready to pick up and move or else get really good at guessing. 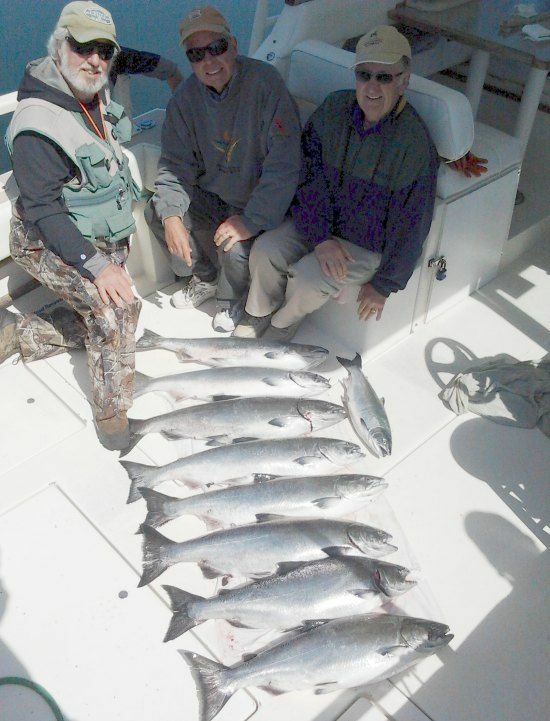 The Chinook moved in close to shore near the end of the month and we mostly fished Little Beach near the end with just a couple runs to Big Bank. 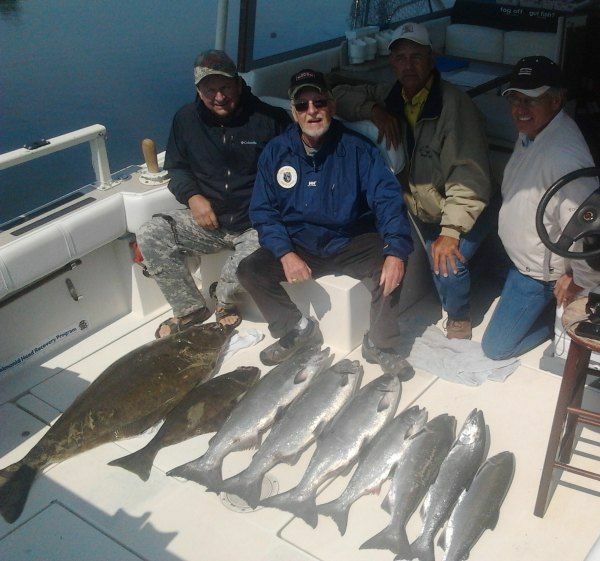 The inshore fishing in 2014 was much better, however it did keep us moving quite often as the fish didn’t stay long in each spot. 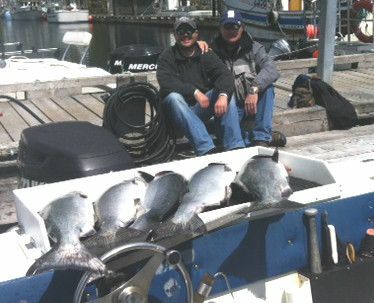 We did have some good days at Big Bank but only ran out there a handful of times when fishing in close went slow. 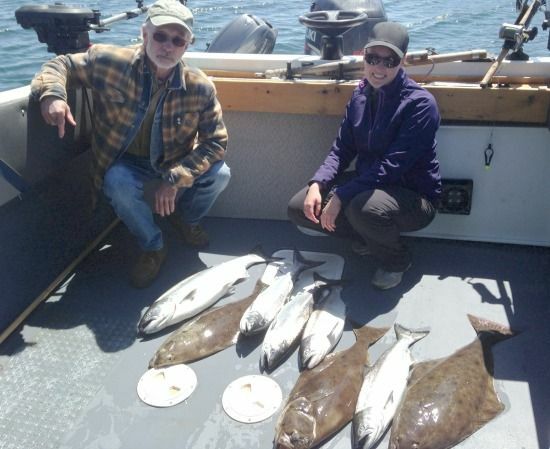 Halibut fishing seemed to be on and off. 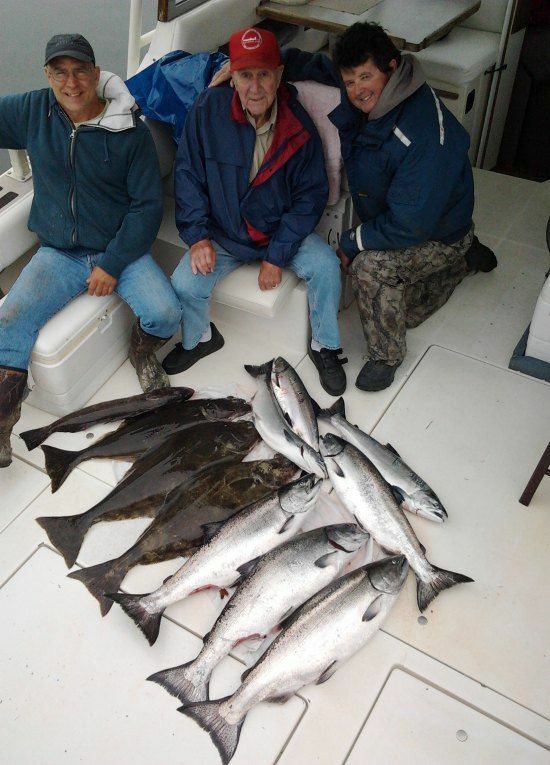 One day we would get lots and the next it would be slow or two days hot and two days cold. 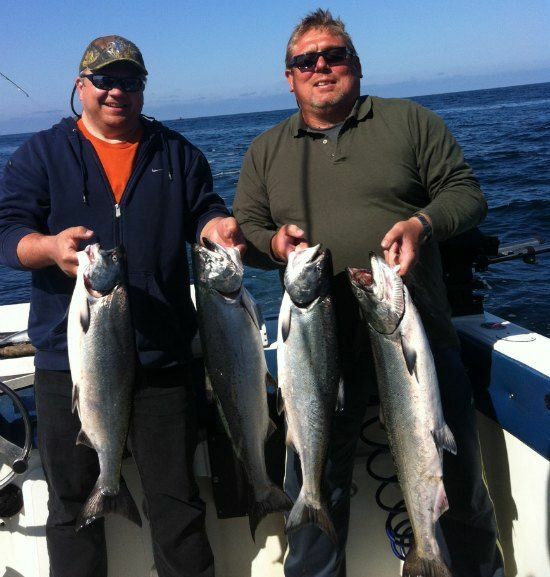 We did get them consistently through out the summer starting in late May right up to mid September. 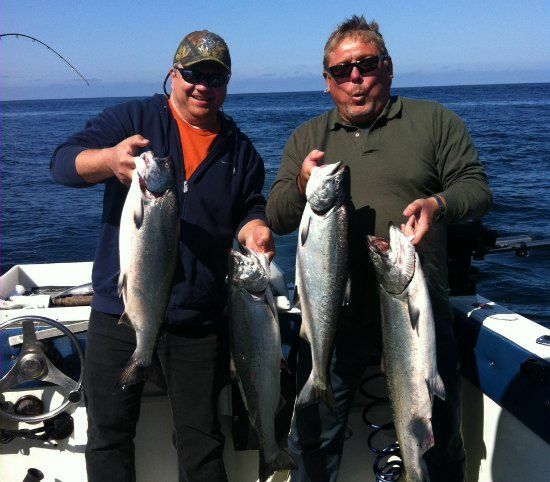 We mostly bottom bounced for them in July about 2 miles from our salmon fishing spot and trolled for them in August when fishing 5-10 miles offshore. 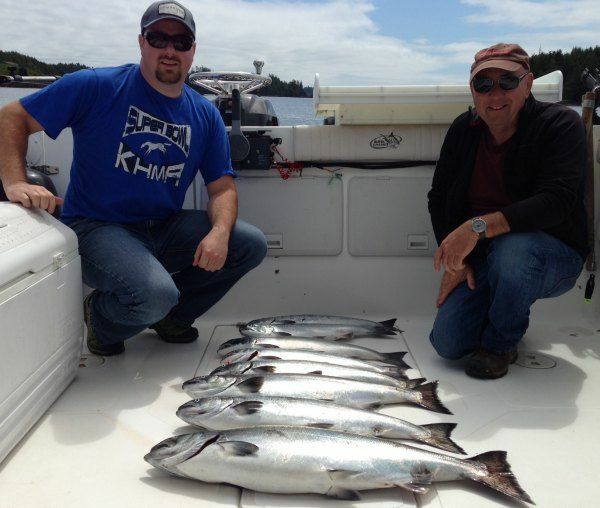 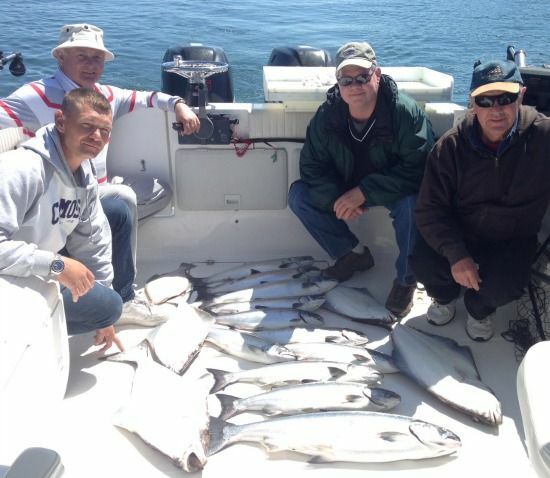 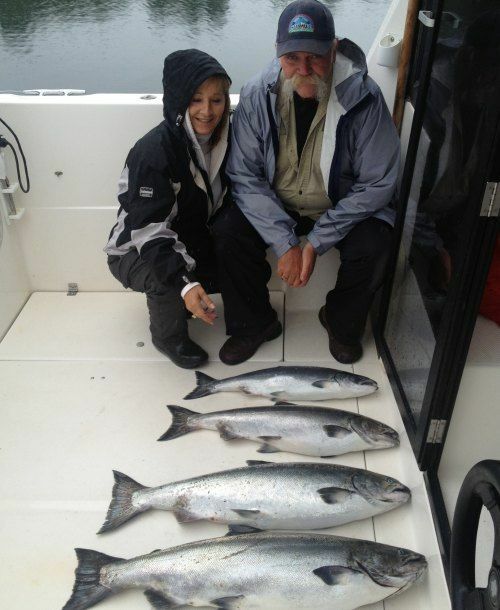 The Coho mostly stayed way offshore, however we did get some good days with Coho during late June to early September. 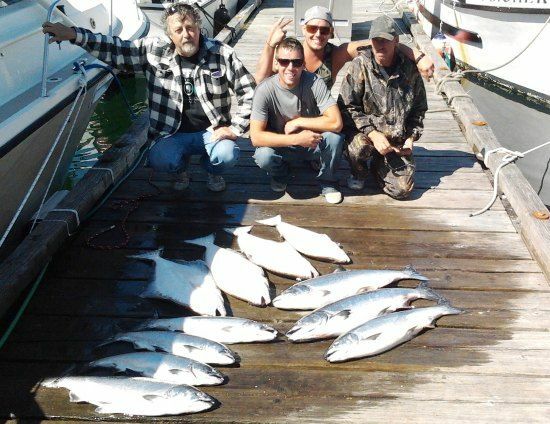 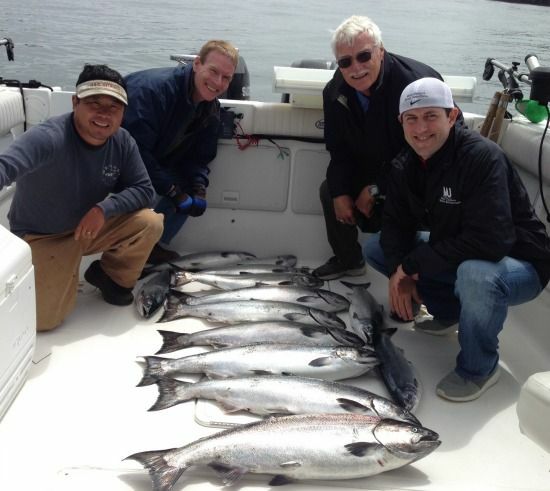 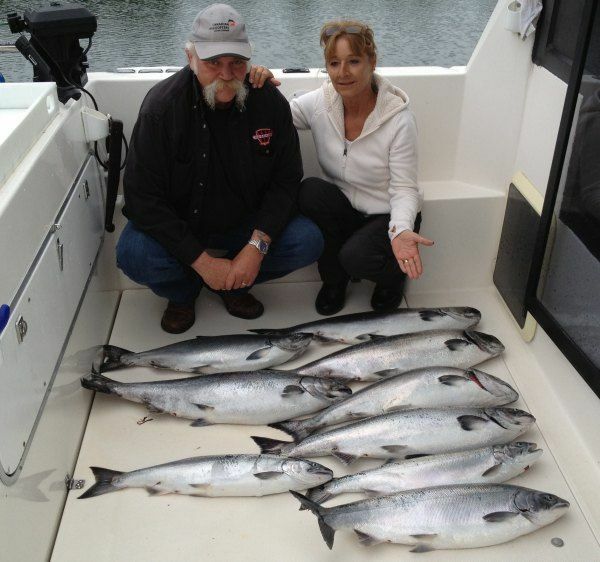 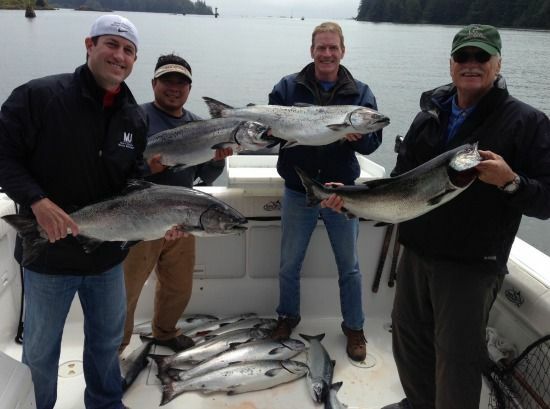 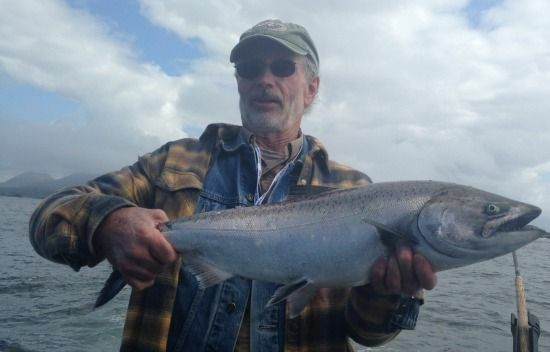 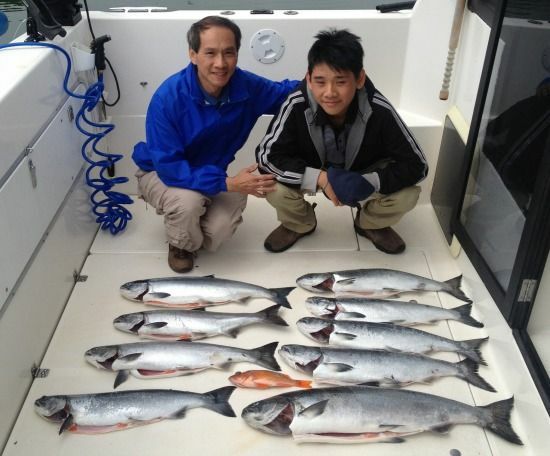 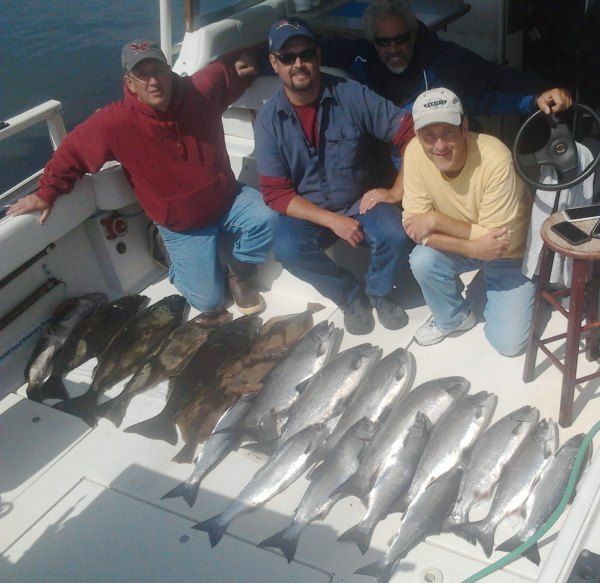 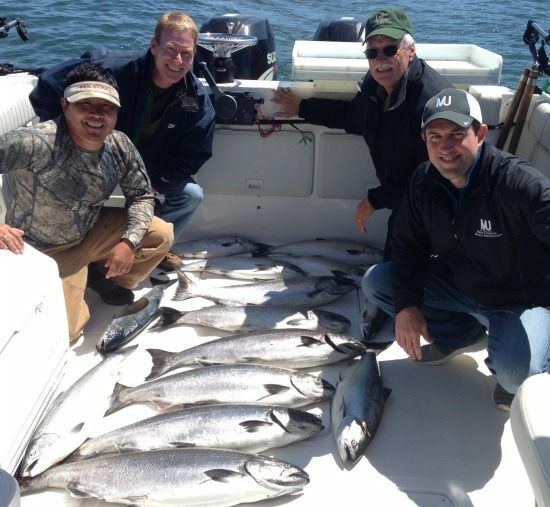 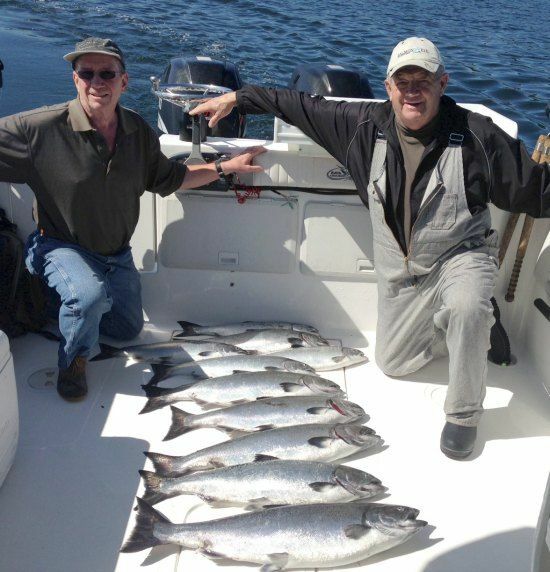 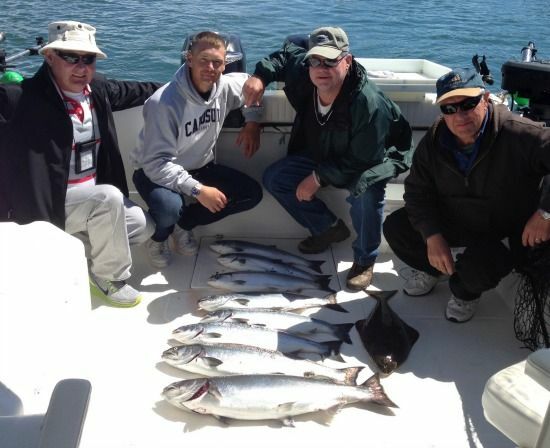 Our best coho days were in early September and we also go a few Chinook in the mix as well. 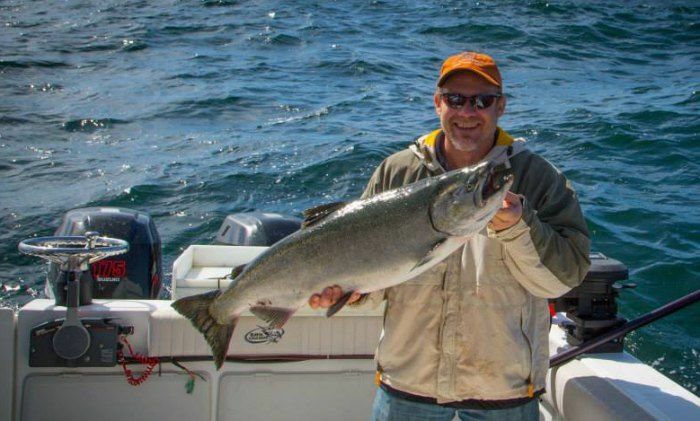 Since we were fishing in close to shore in early September, if we caught a Chinook while Coho fishing it usually was a nice one. 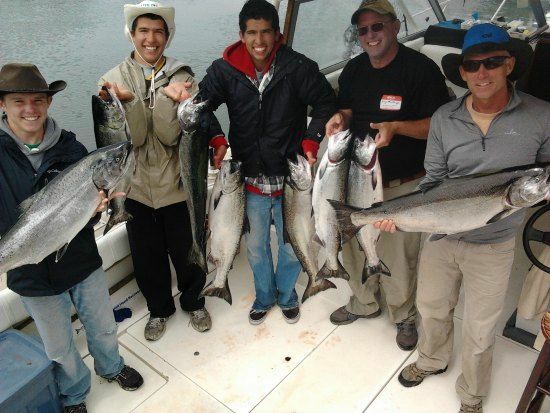 Check our fishing packages for an action packed fishing trip. 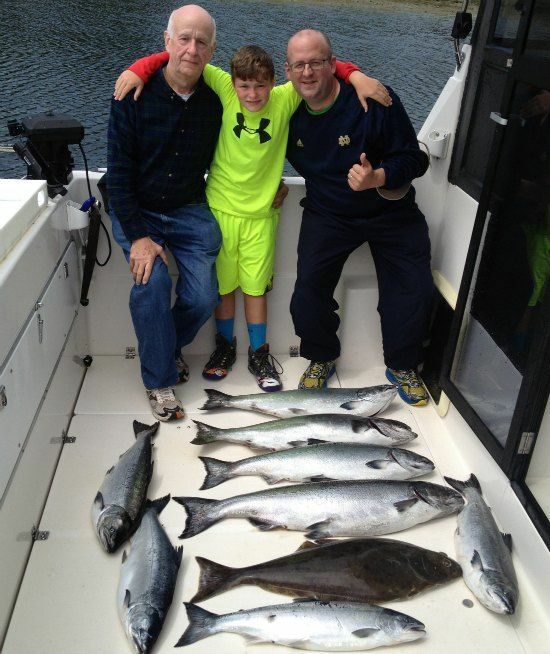 Below are a few pics from the summers fishing! 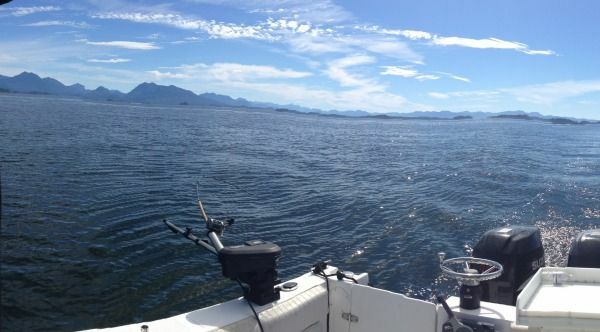 Heading out May 31, 2014. 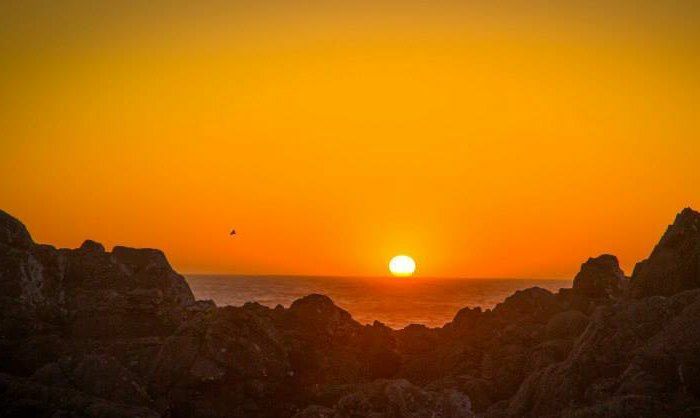 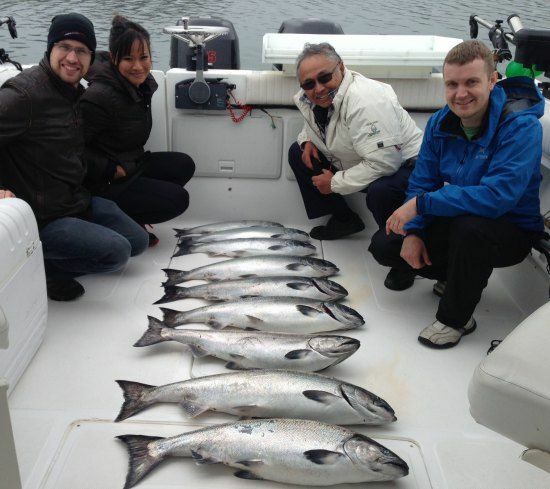 Come out for a great adventure with us! 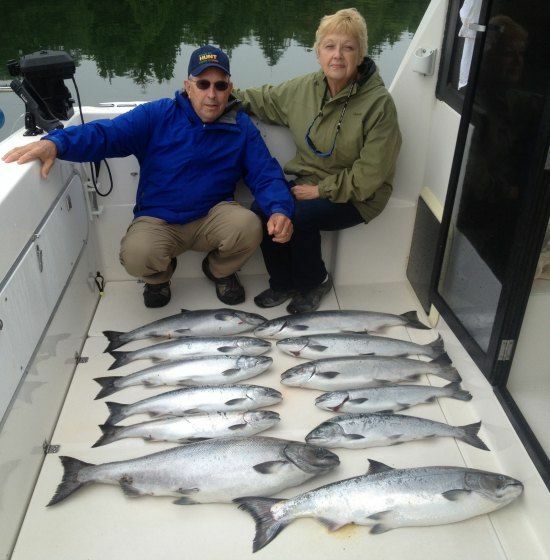 James and Norma Bird with Lenny Laboucan June 6, 2014. 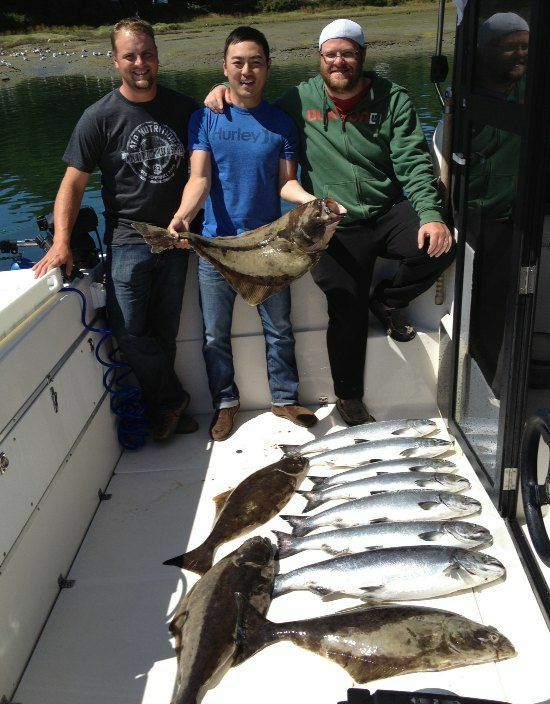 Great day on the water! 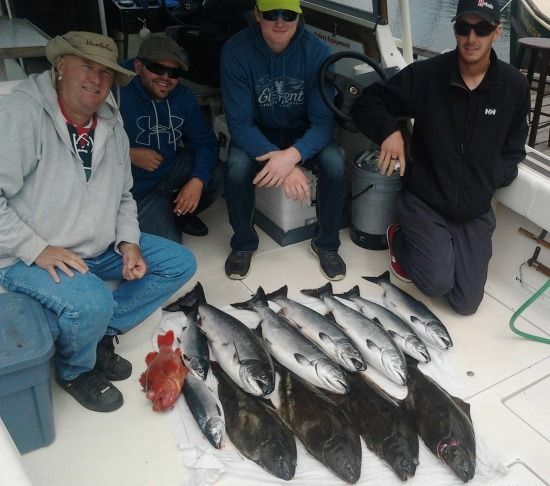 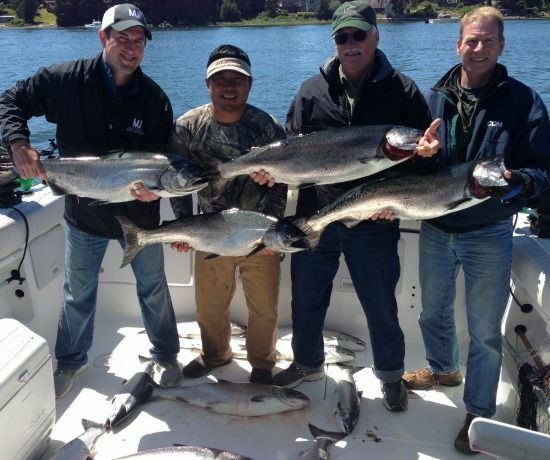 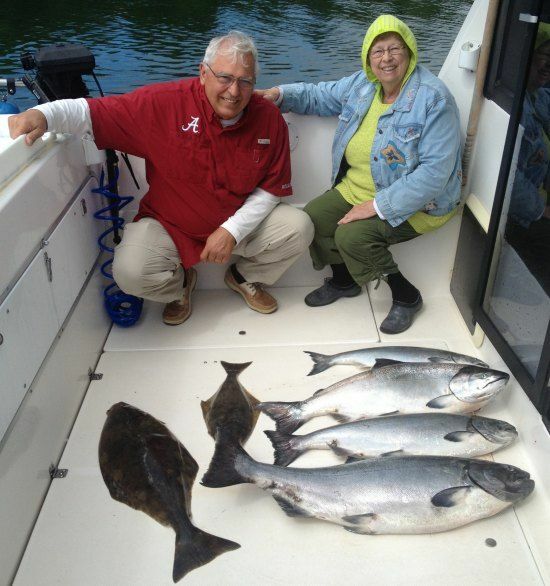 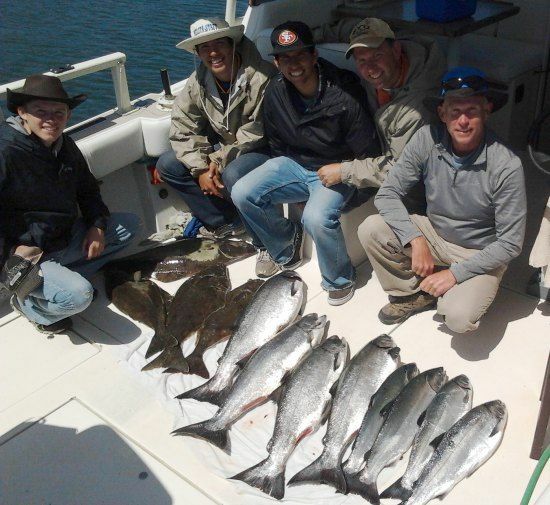 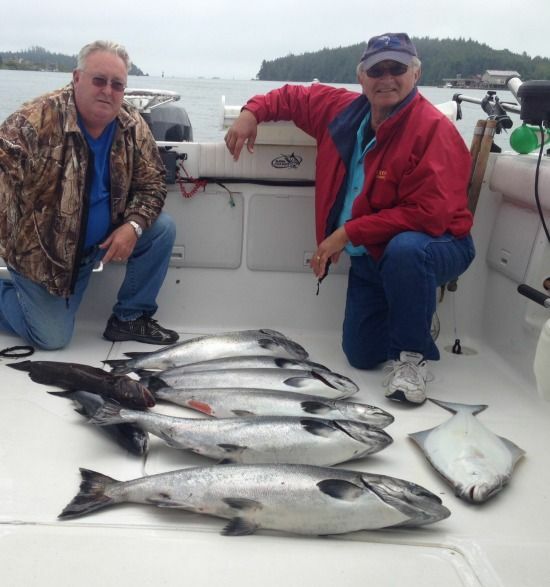 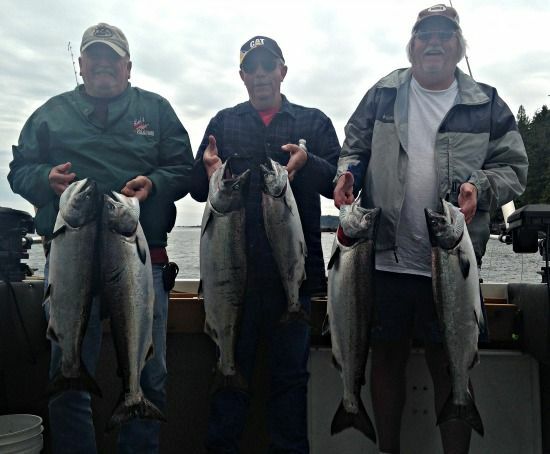 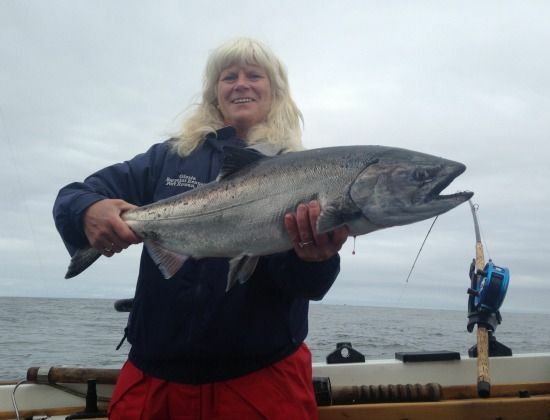 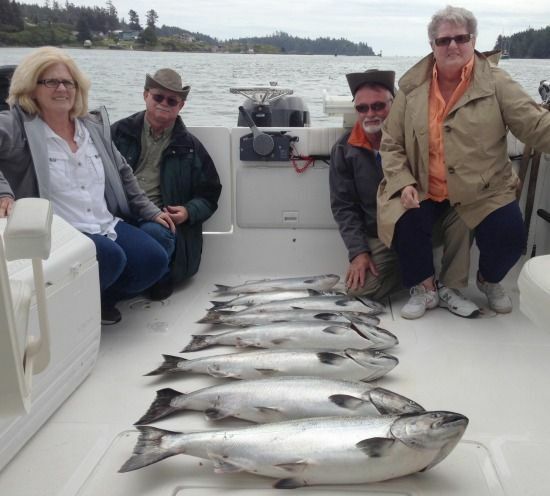 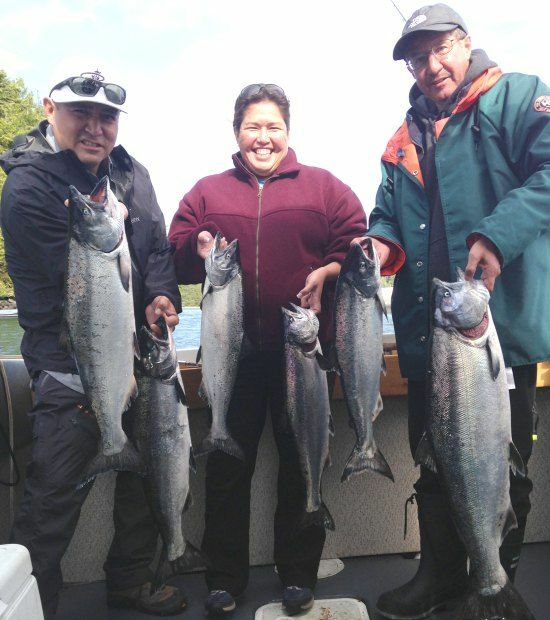 Peay group June 11, 2014 fishing Big Bank trolling for their salmon and halibut. 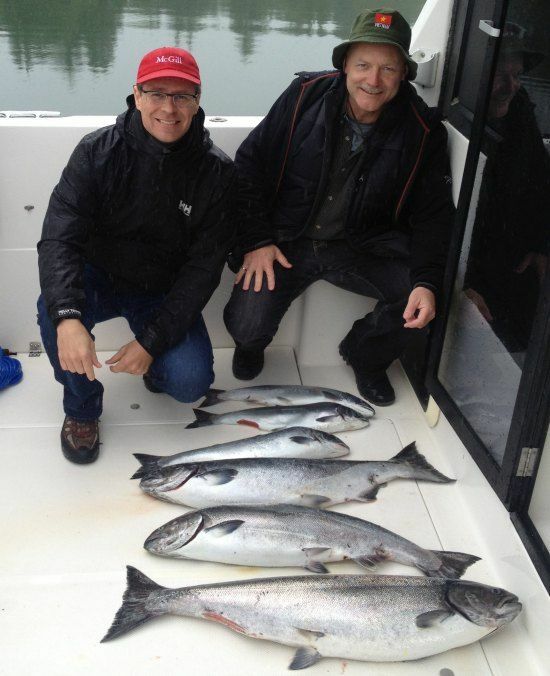 Ed Stauffer June 17, 204 showing off his catch! 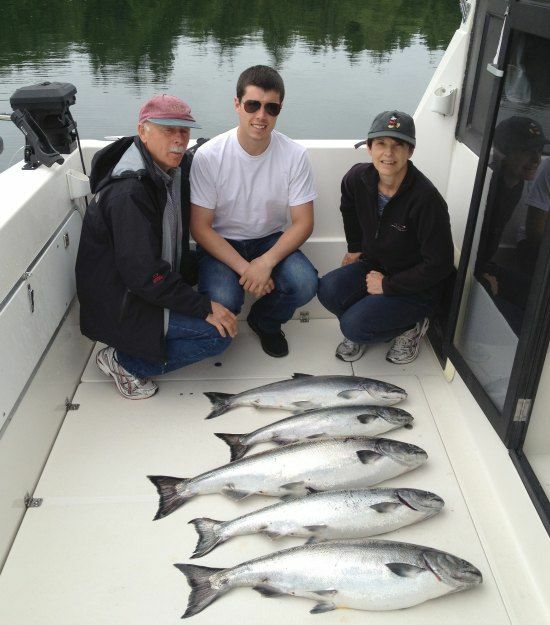 Pistone group June 17, 2014 fishing Big Bank. 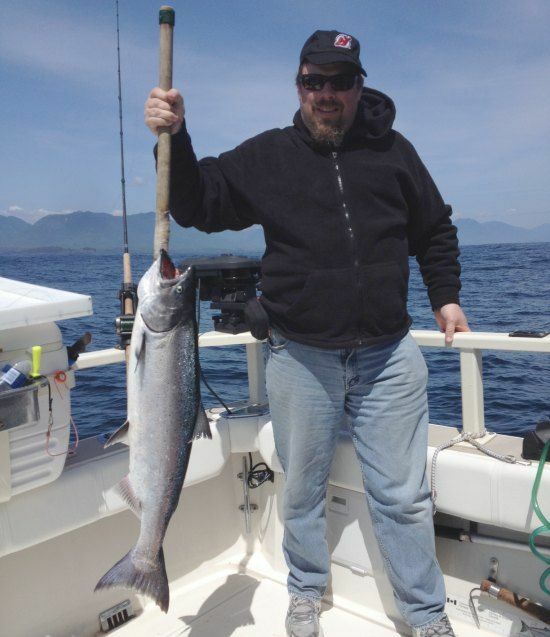 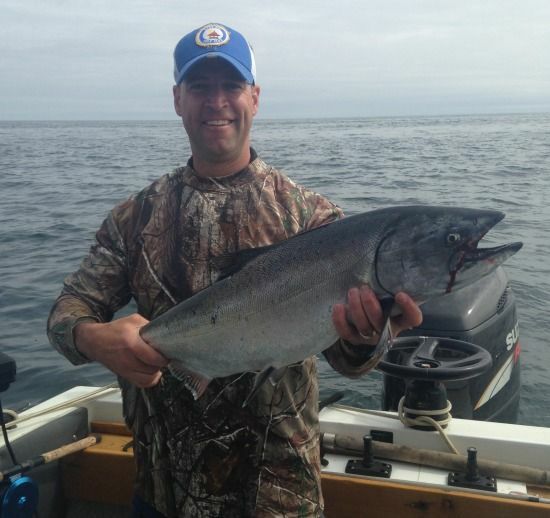 Brad Price with a nice Chinook June 18 from Great Bear Rock during an afternoon's fish. 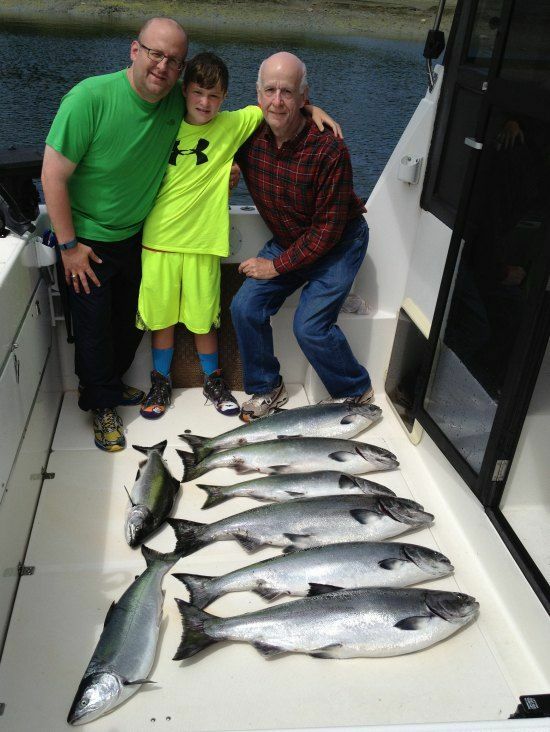 O'Neil family June 18, 2014 with a nice catch from Big Bank. 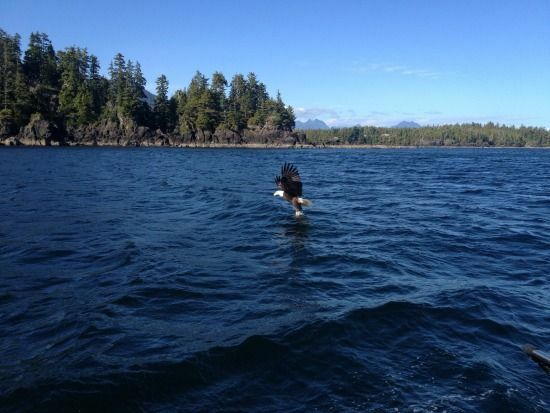 Feeding the eagle June 30, 2014! 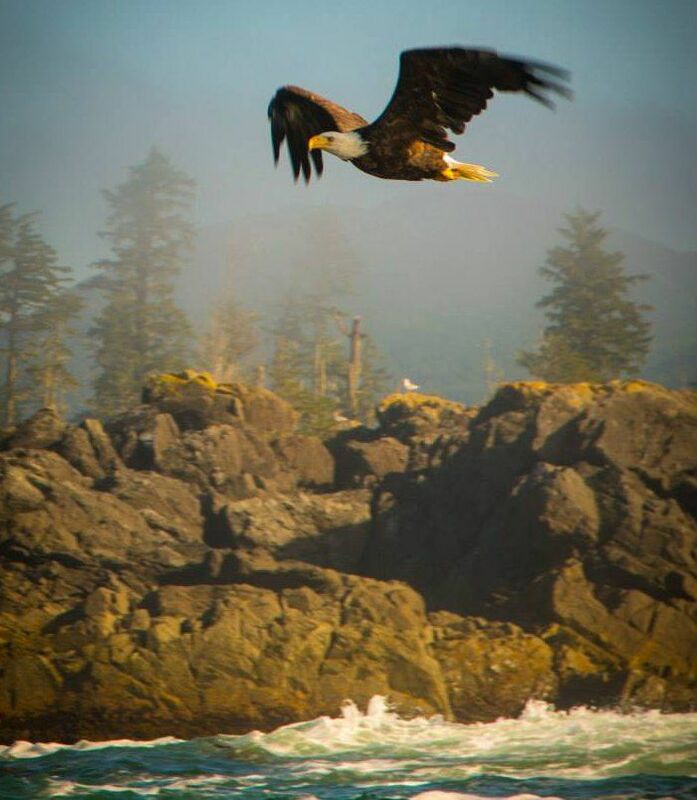 What a majestic bird! 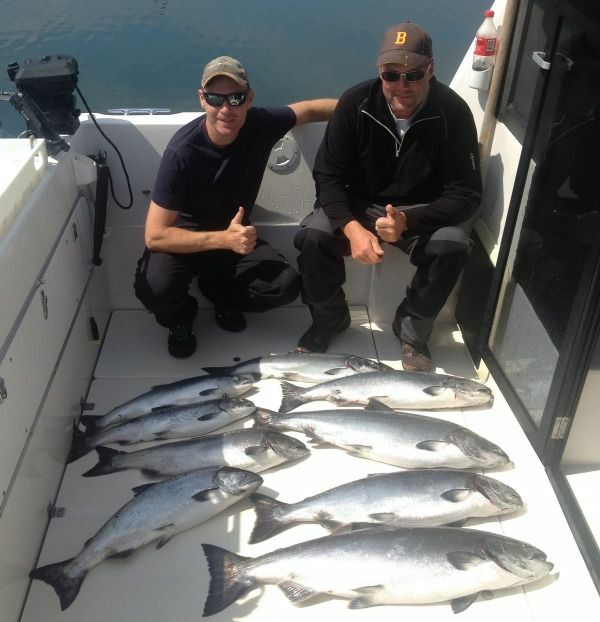 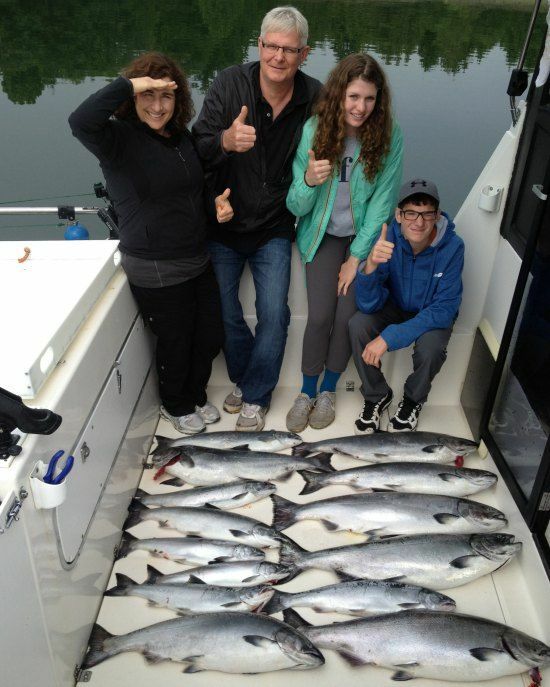 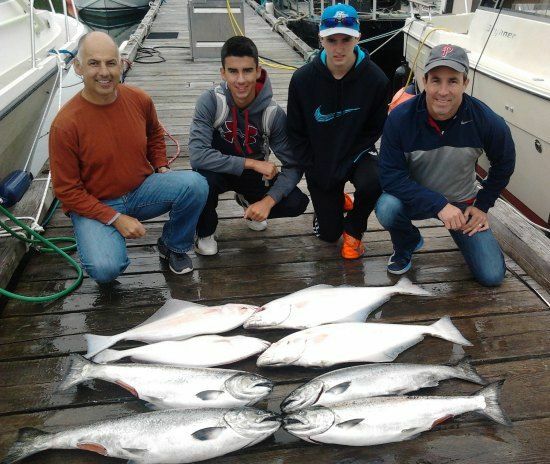 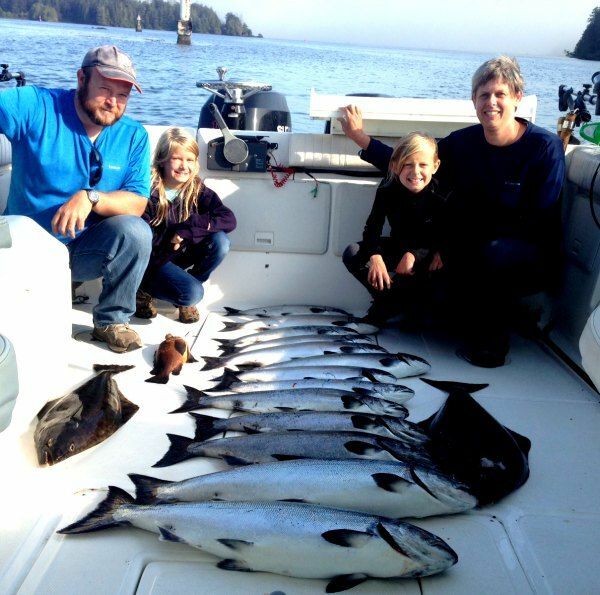 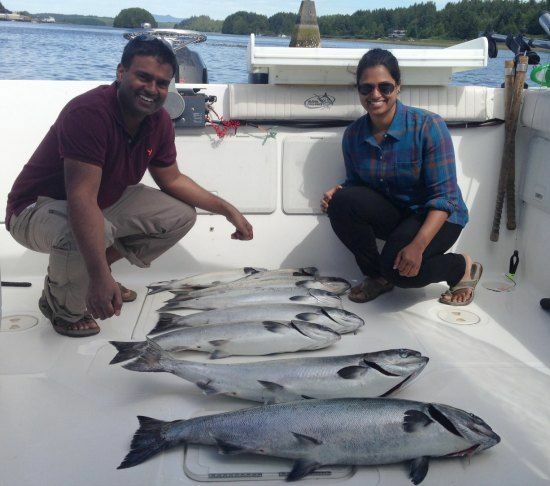 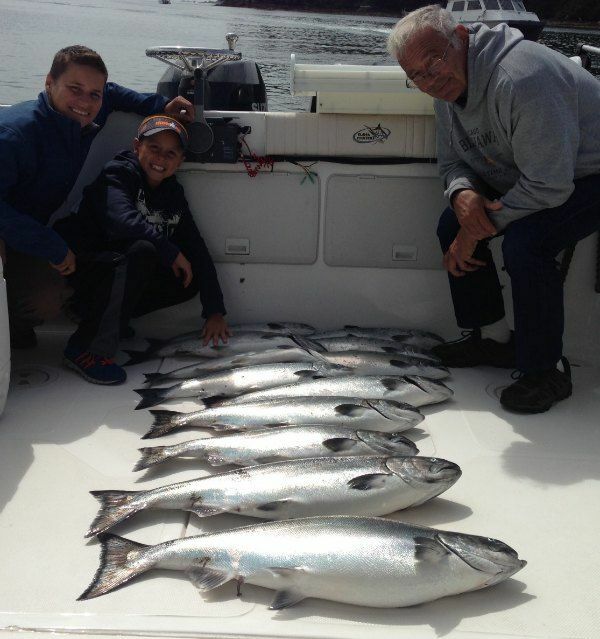 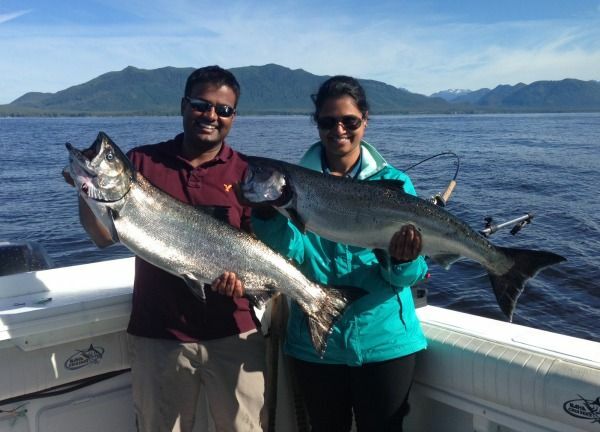 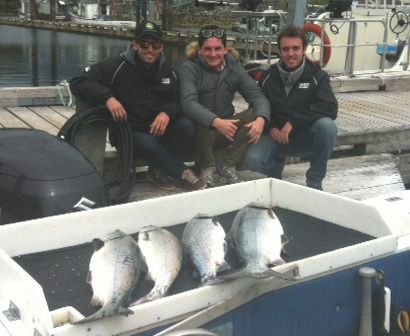 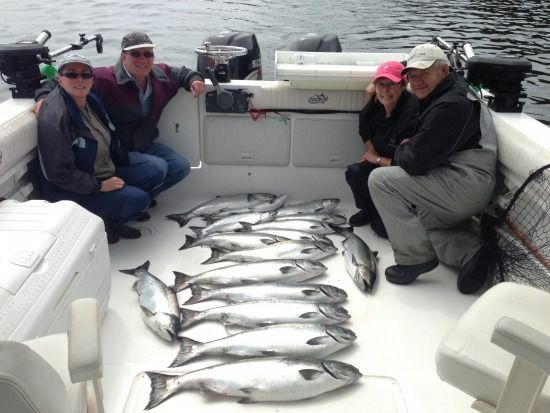 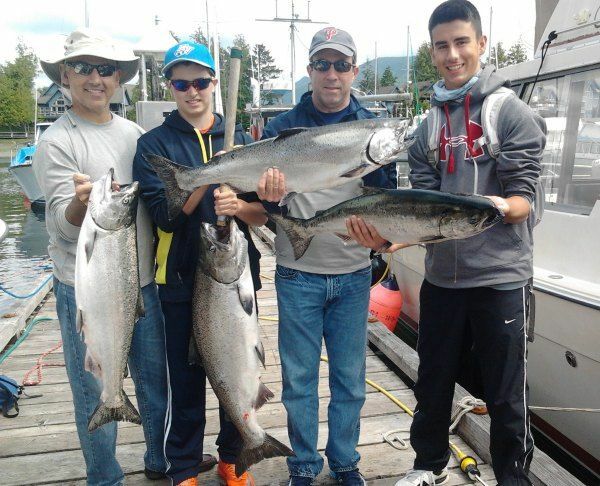 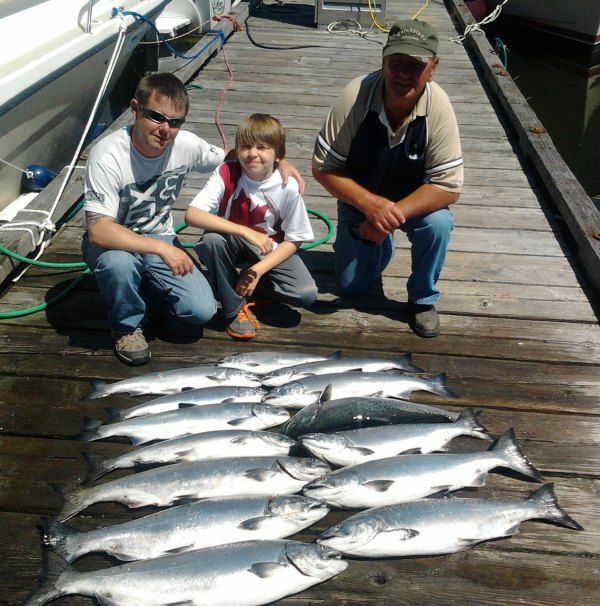 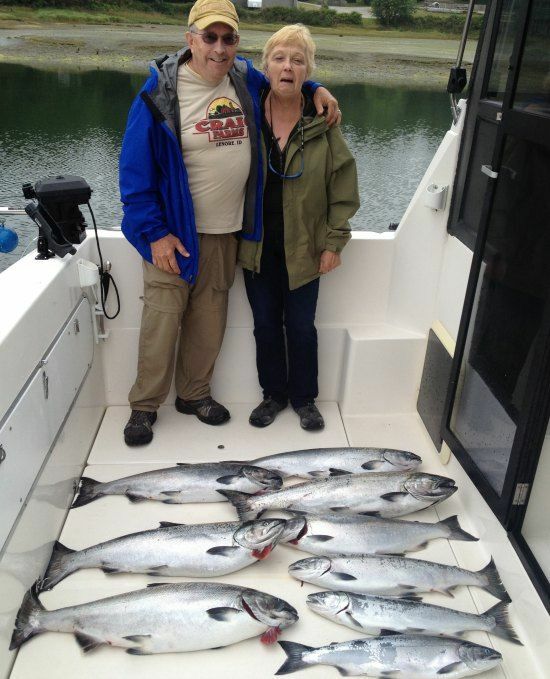 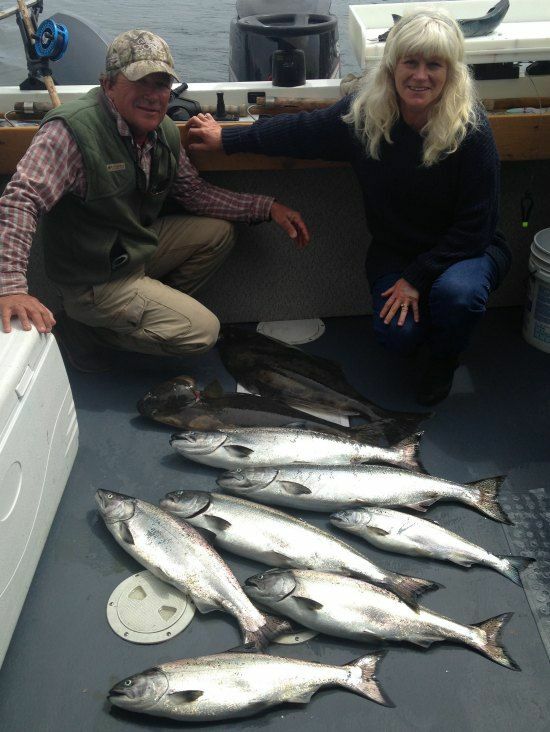 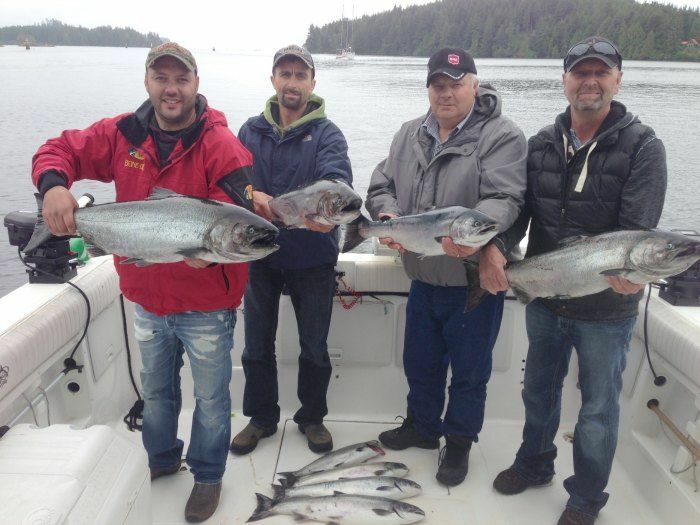 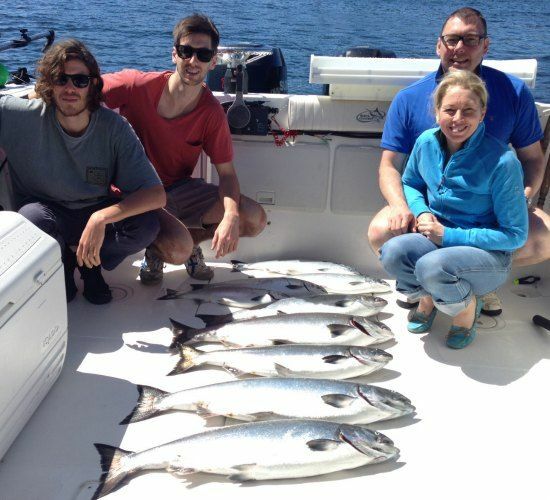 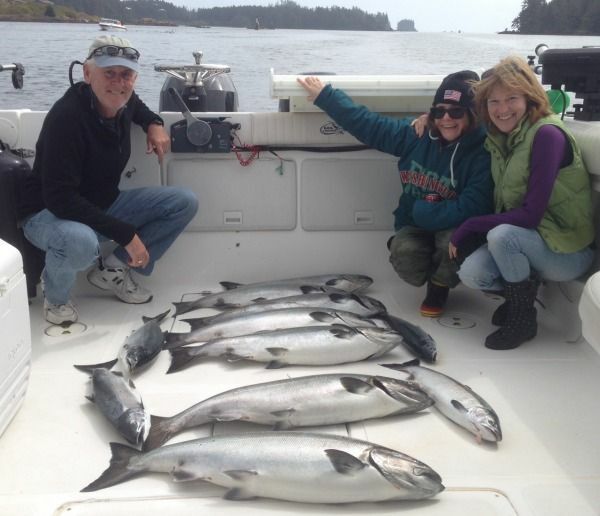 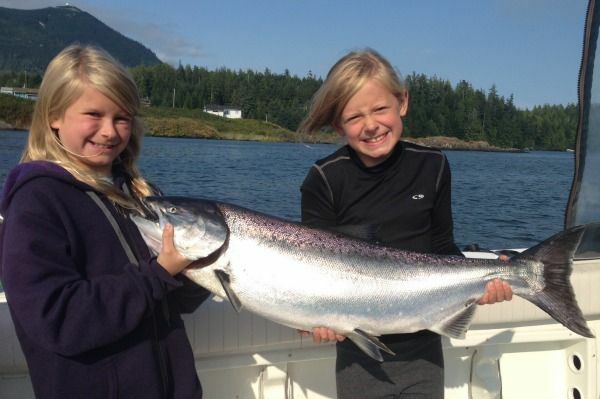 Bariahtaris family hold a few of their Chinook caught at Florencia Bay July 3, 2014. 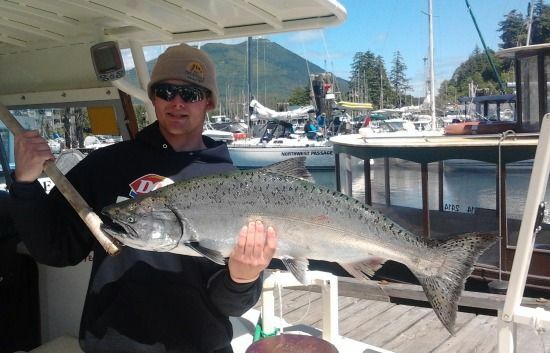 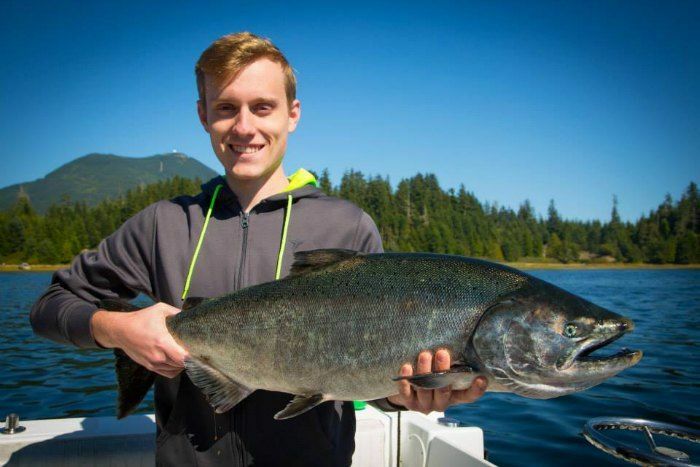 Congratulations to Max on his 32.5 lb Chinook! 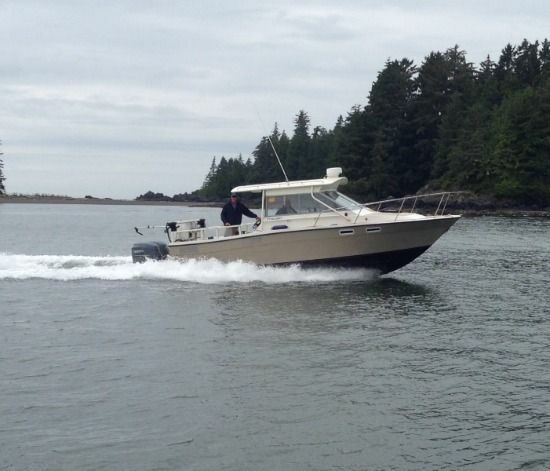 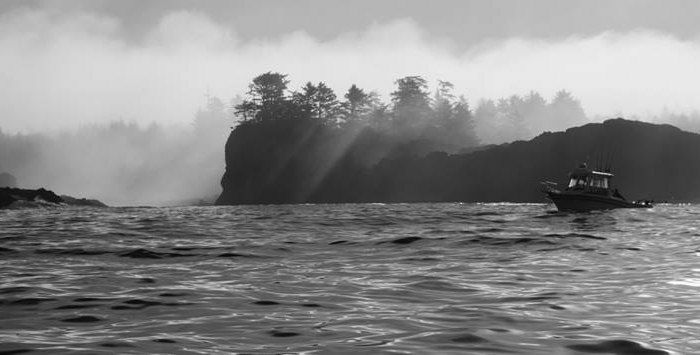 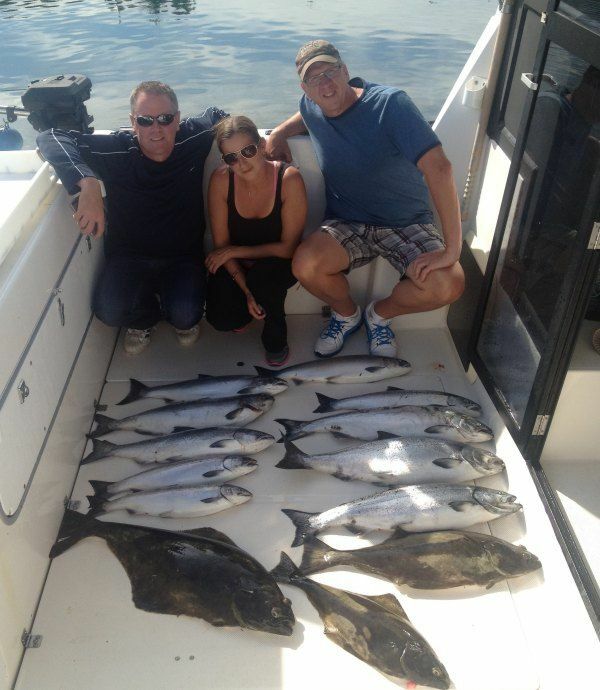 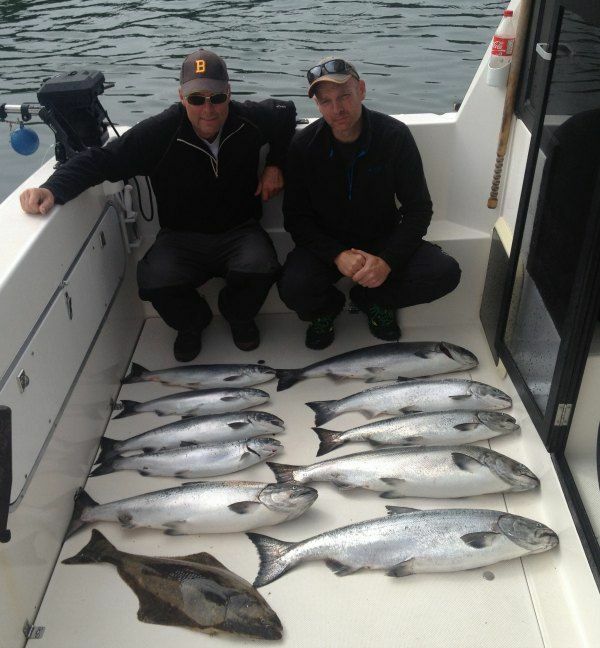 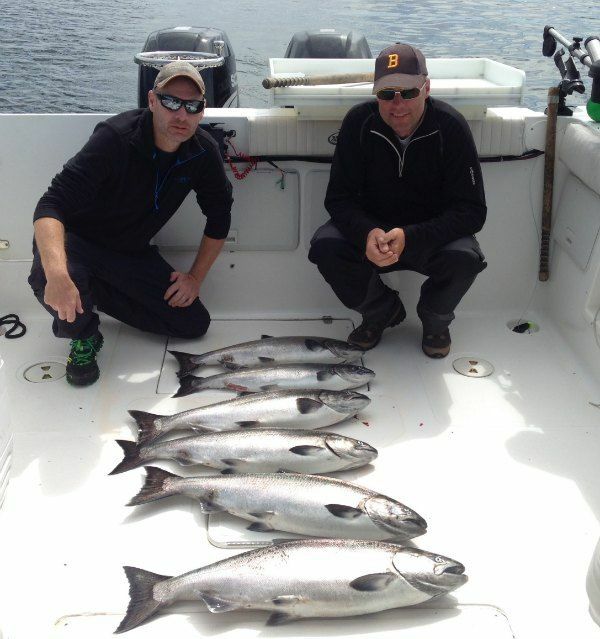 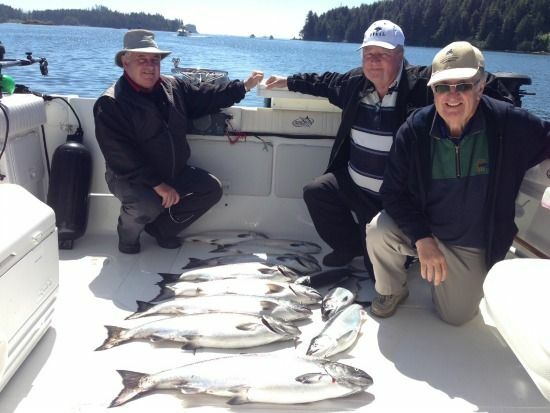 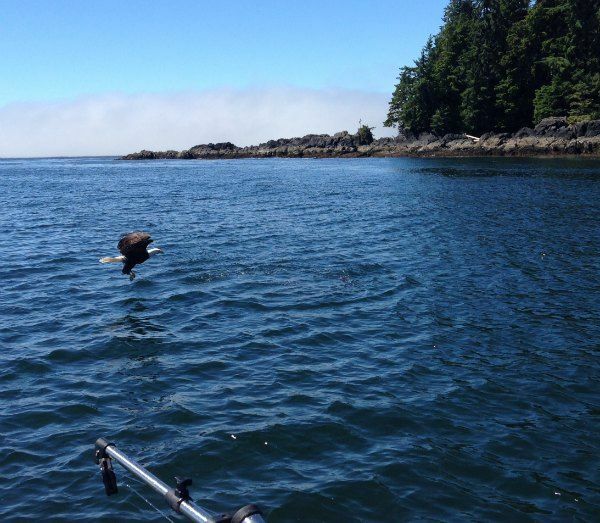 The Hargroves out from Comox July 4, 2014 fishing Florecia Bay. 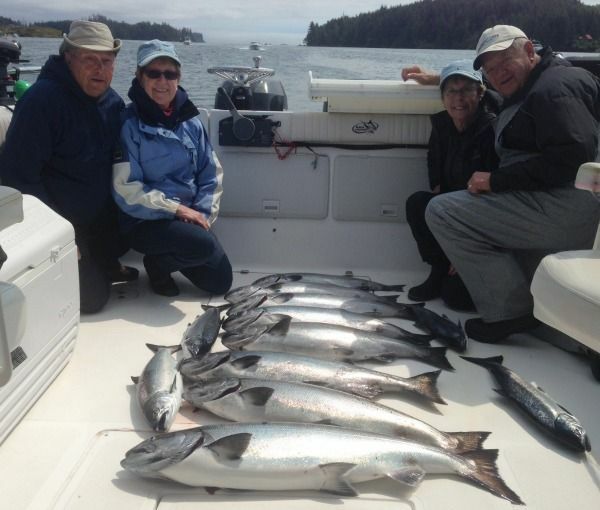 Bill and Janice Howard and Jack and Susan Howard July 22, 2014 enjoying beautiful BC! 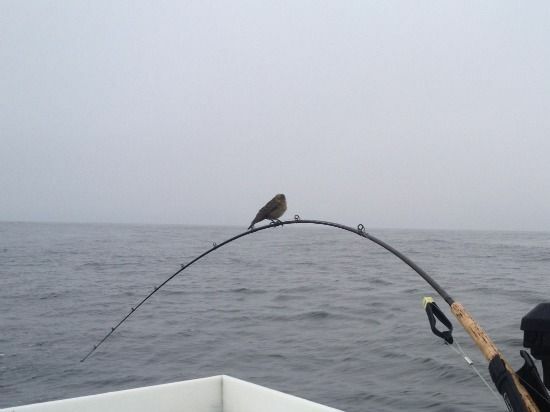 A little bird taking a stop August 6, 2014. 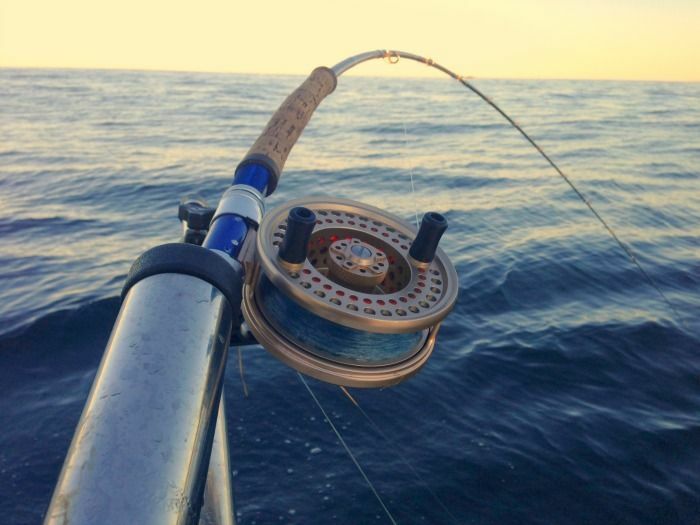 The rod didn't even move! 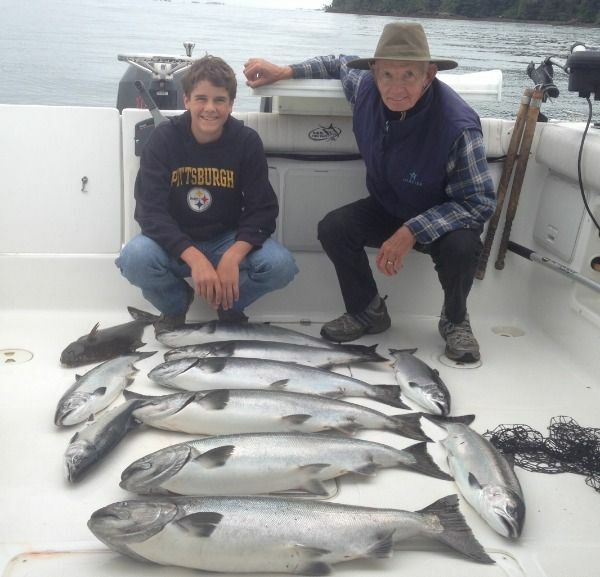 Jerry Vandervalk and grandson Cody Zook (my nephew) August 7, 2014. 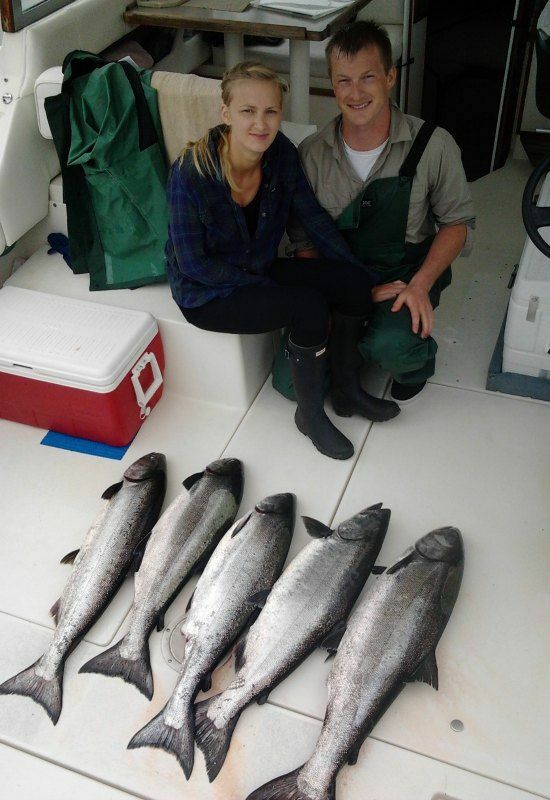 Cody got to reel in all the fish! 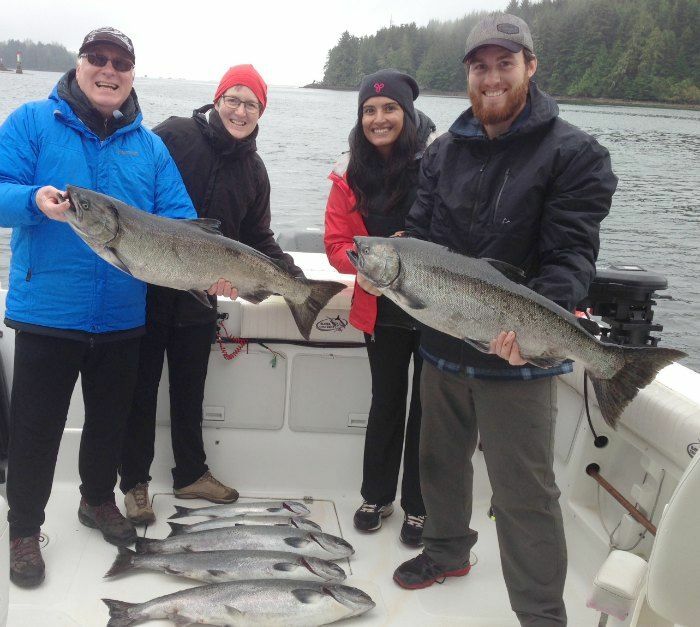 Corporate business retreat for Boudewyn party August 18, 2014. 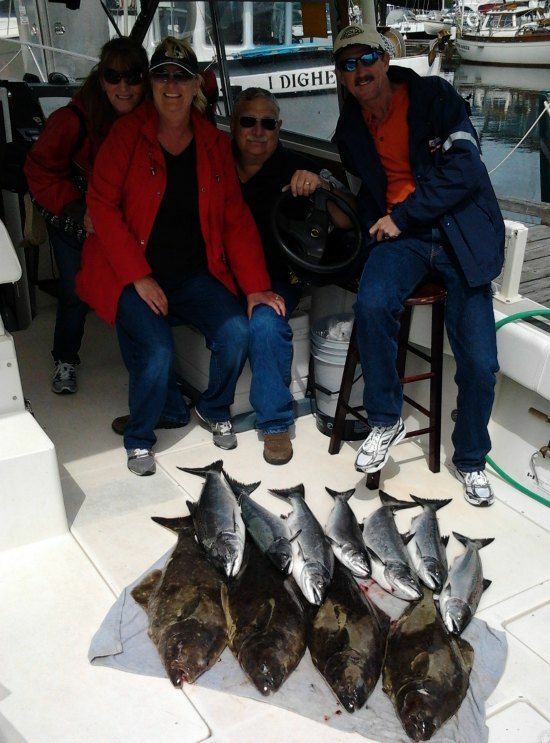 Great way to spend a business meeting! 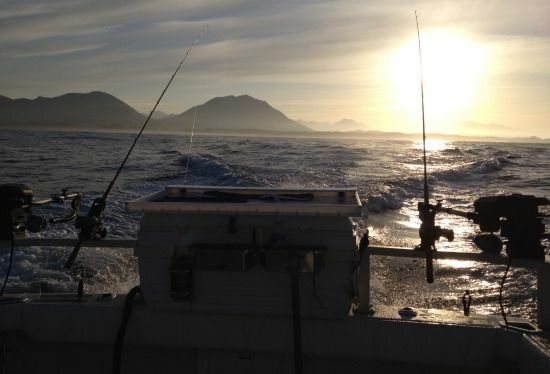 A picture that can cause your heart to beat faster! 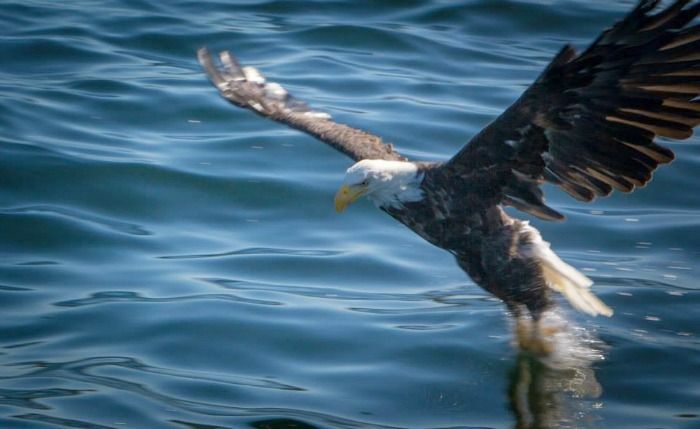 A bald eagle coming down for a fish on the surface. 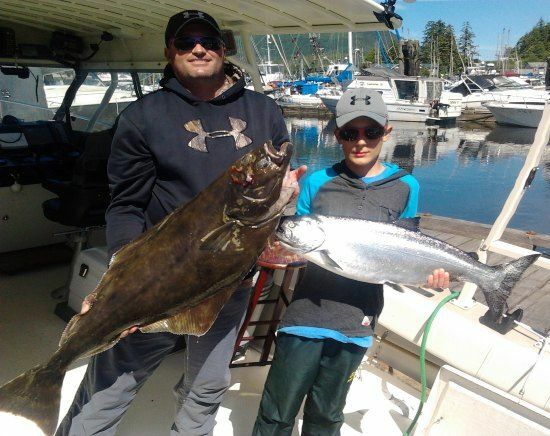 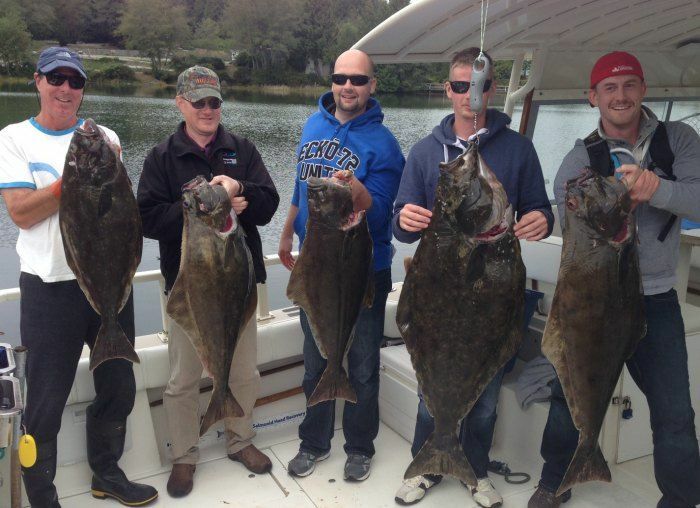 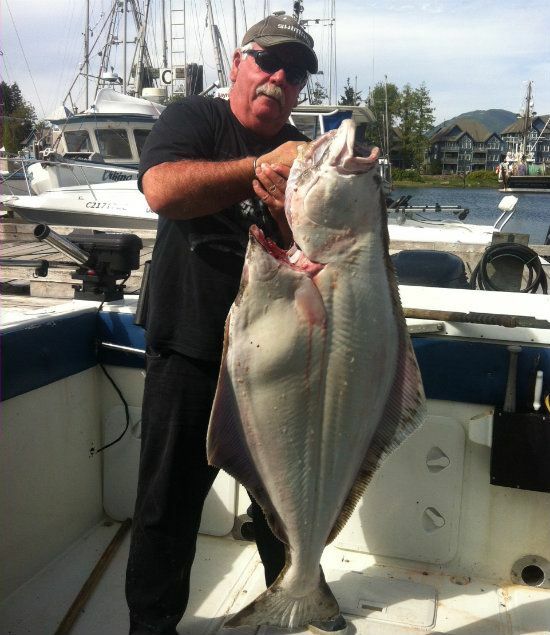 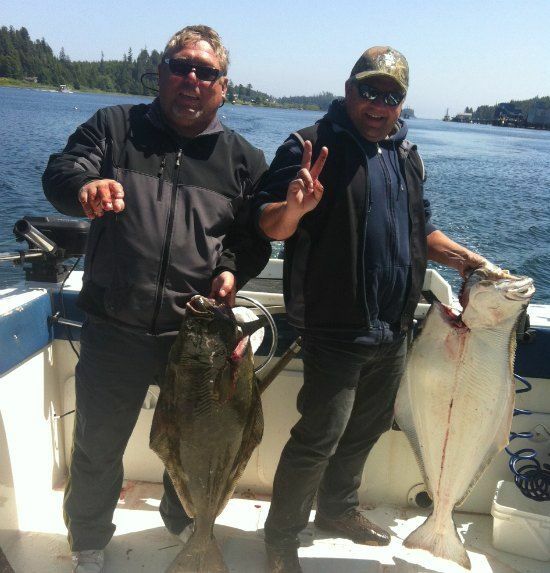 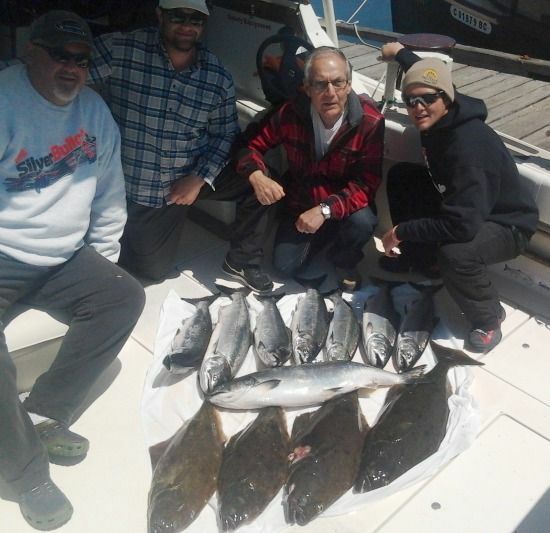 Wiebe group September 8, 2014 with some nice halibut.